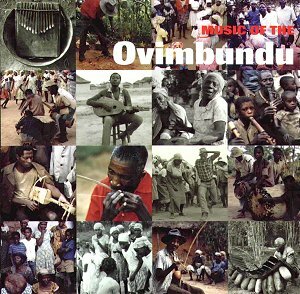 The Ovimbundu are a Bantu speaking people, living in the central highlands of Angola, and on the evidence of this CD, they have - or more probably had in 1971/2, when the recordings were made - a rich and varied musical culture. The disc culls 29 items from more than 700 recorded by Ulrich Martini, then working as a teacher in the region. By the early seventies, as co-annotator Hermann Pössinger points out, the pre-colonial way of life, in which the women were responsible for agriculture, and the men for trade, war, building and metal working, had been much changed. Christianity had been overlaid on older beliefs, also bringing monogamy in its wake; the authority of traditional healers and the tribal chiefs had been sapped by the Portuguese administration; the Ovimbundu men had become wage workers on the coffee plantations; and traditional agricultural practices were no longer enough to ensure self-sufficiency. As someone who thinks that history is mostly a record of changes in the mode of human suffering, I'm not as sure as Pössinger appears to be that all this represents a decline from a Golden Age; but there seems no reason to doubt his contention that by the seventies, music had also become more of an entertainment, and less an integral part of daily life and ritual. Nor can it be doubted that life became much worse for the Ovimbundu, a peace-loving people, often derided by other tribes as lackeys of the Portuguese, after civil war broke out in 1975. They now live in an area devastated by war, over-cultivated, and sown with land mines. Probably of less moment in the day-to-day struggle for existence, but significant in the context of this CD, the deaths of older musicians and the disruptions of war have resulted in the disappearance of many songs, and even some musical instruments. Or perhaps one should write that by 1971 it had become thoroughly integrated into the local musical culture; excellently recorded and remarkably varied though it is, this CD documents musical expressions that have vanished, are under threat, or at best are increasingly detached from the social and religious functions they formerly served. It is, I suppose, a tribute to the power of music, and of the human spirit, that the music of the Ovimbundu, so far away in time, space and meaning from most of those who will hear it, emerges from CD speakers with such immediacy and energy, and with its importance to the society that created it instantly and vibrantly apparent.